I just received a set of watches batteries to replace them in my Tissot watches. Unfortunately, after trying 3 of them (of 5), I think my good old watches are dead now. Another option is that I was royally f#cked up by getting 5 dead, but sealed batteries. I might double check this by ordering few more, it's a question of a few bucks only. The problem is that I don't know what was the original battery, but I find Energizer 371 (SR69) there, when opened it. However, some sites quoted the movement type to have R377 (SR66) type of battery, or SR626SW, as alternative. I had this watches for about 11 or 12 years. 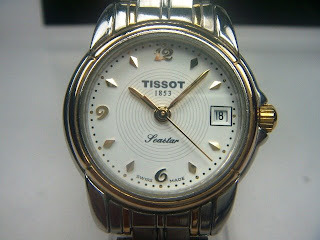 This is Tissot 1853 Seastar, two tone (white and gold) with the bracelet and date. Internally, they are running quartz ETA 955.114 (955114) movement. I like them so much. They've been with me for very long period of time, and I replaced the battery there only once. And a mineral glass, replacing it with another mineral one. However, it was two times high of the original one, so it can be polished when the scratches appear. This is not a decent watches, but very nice looking. So now I about to challenge the close-by watch repair shops to find out what can be done to get them back alive. I know that the movement itself is pretty cheap - one can get it online for less then 25 bucks. Everything else is okay. So just in case if I'll be quoted too much, I might get the new movement and replace it myself (a piece of cake, especially, keeping in mind that they are already dead :). P.S. Actually, the problem is not with the battery, as I tried a few. None of them worked. So I think it's pretty much something else. As for now, the best thing for me could be to play with movement replacement. As far as I remember, the ESA/ETA 955.114 is about 20-25 bucks, or can be replaced with the more high end one - ETA F06.111 (replacement for both 955.114 and 955.112). Otto Frei has it for $16.95 + s&h + taxes, so it's around $25 as well. I might save some money by visiting their store, if it could be an option (however, they're based in Oakland, so toll rate of $4 makes me think twice about visiting the store :).